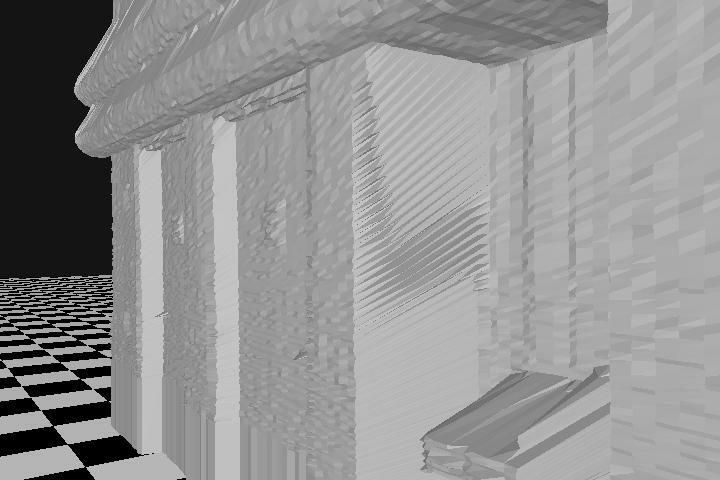 Mobile robots can be used to create 3D models of indoor environments. Different sensors like stereo vision or laser range finders are available for that task. This work searches for a way to compress data from a range finder in real-time on board the robot allowing for incremental transmission to a host in short bursts, where it then can be optimized for visualization. 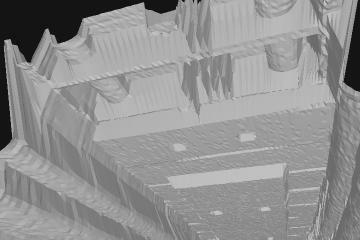 The data for this work is acquired by a SICK LS200 laser scanner which is mounted on top of a Nomad 150 robot. 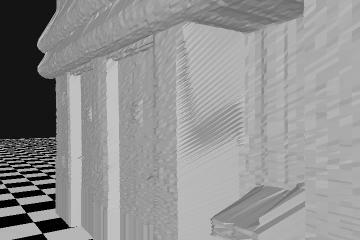 The laser scanner scans 180� in a plane perpendicular to the movement of the robot from one side over the top to the other side. Each half a degree the distance to the nearest object within 8 meters is measured with a resolution of 1 mm and noise of typically several mm. 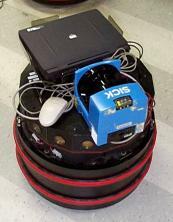 The robot moves with about 0.25 m/s while 5 complete scans per second are performed. 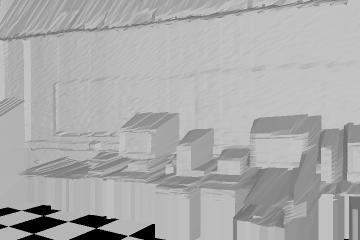 The resulting data is transformed to 3D coordinates and displayed using OpenGL. Free navigation through the model in all directions is possible. Since the laser scanner is mounted on top of the robot it cannot see obstacles below that height. 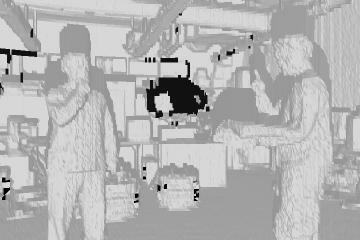 For a more realistic view the first and last measurements of each scan are projected down to the floor. 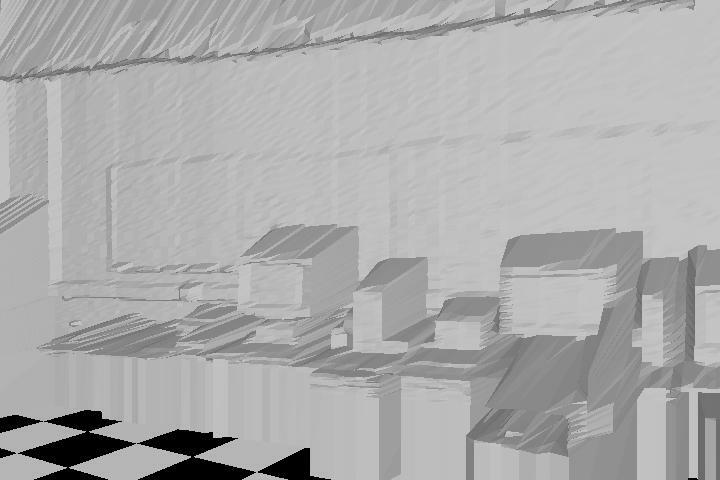 Additionaly the checkerboard on the floor makes keeping track of distances easier (gridsize 0.5 m). 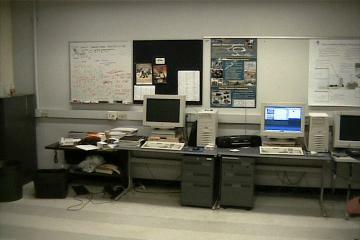 For efficient wireless transmission of the data, several compression algorithms were tested on real data. These were the standard compression programs Unix Compress, gzip, bzip2; the lossless image compression formats PNG and JPEG-LS; and the Haar and Linear Wavelet, and a specifically adapted Wavelet, that we call the Radial Line Predictor. Additionally, JPEG-LS was tested in lossy mode for maximum errors of 1, 2 and 4 millimeters. For more details and results see our Tech Report below. The software written for compressing the data onboard the robot, and transmitting and displaying of an incremental 3D model in real-time is available for download. 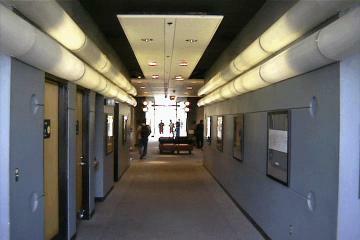 Corridor in the MaRC building. The checker board floor is added for better visualization of the model. The corridor seems to be curved due to the dead reckoning error of the robot. A picture taken from about the same perspective is given for comparison. 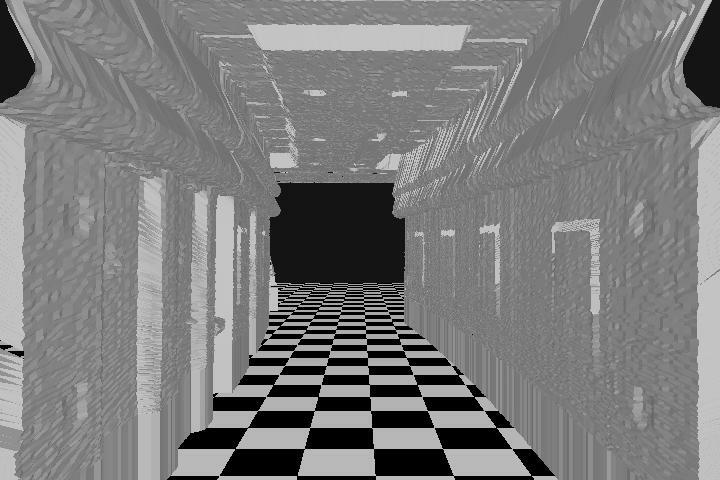 These two images are taken from the same corridor model as used above. The left image shows doors and a water cooler, even the signs on the doors and the door knobs are visible. The right side shows pipes and lamps on the ceiling. Alex and Endo in the Mobile Robot Lab. The blimp in the background seems to be invisible to the laser scanner. For this model only the laser scanner was rotated together with the top of the robot instead of moved through the room by the robot.